My favourite part of the computer program is creating models. There is a line in the poem that goes: “They sailed away, for a year and a day, to the land where the Bong-tree grows”. The Bong-tree is mythical so is open to interpretation. I thought it would be fun if the Bong-tree made a bong noise whilst bouncing like a spring. The first step was to build the tree. The tree trunk was done by drawing one side of the outline in the modelling window of Animation:Master and using the lathe tool create a 3D tube. For the palm leaves I drew the complete outline and then filled it in with a network of four-point patches. The leaf was then copied eight times and positioned near the top of the tree trunk. Bones were added to the trunk and leaves to aid the animation. The tree was animated with a combination of muscle and bone movements. If you are unfamiliar with the way this works there are some excellent video tutorials on the Animation:Master website that show the process in detail. Select an area and move it down to start the bounce. Having got the tree to bounce the way I wanted, I decided to place it on a desert island surrounded by sea. 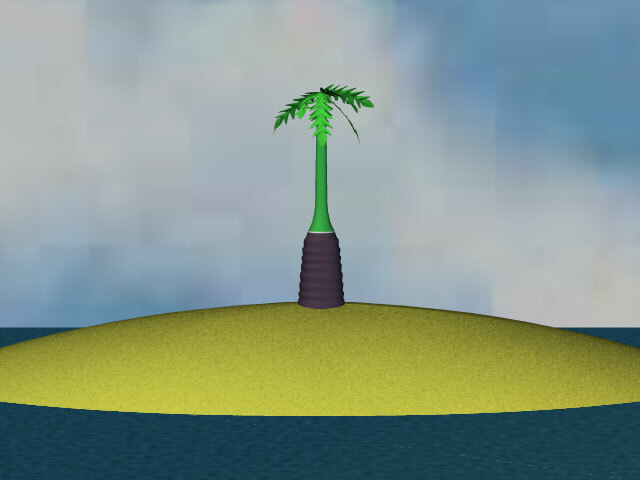 The island is the top part of a ball shape, coloured yellow and given some roughness to look like sand. The sea is a flat patch of blue that was given some roughness and sparkle to look like water. I animated the sea patch across the set to give the sea some movement. The sky is a picture of clouds on a vertical patch. Once my test scene was rendered I imported it into Windows Movie Maker and added a bong sound using the technique described in my “Using Windows Movie Maker to assemble your animation” article. I also added a sound effect called “forest” either side of the bong sound. Click on the pictures above for larger versions.